I'M NOT MUCH OF A PRETTY PICTURE GUY, but now and then it's fun to just take a nice image of something without trying to extract any scientific value from it. So below is my very small collection of Messier objects. WHAT ARE MESSIER OBJECTS ANYWAY?- In short, they are the best and brightest examples of the various types of objects that make up the Universe. The Messier objects are a set of astronomical objects catalogued by French astronomer Charles Messier in his catalogue of Nebulae (yep, that's how they spelled it back then) and Star Clusters first published in 1774. The original motivation behind the catalogue was that Messier was a comet hunter, and was frustrated by objects which resembled but were not comets. He therefore compiled a list of these objects. The first edition covered 45 objects numbered M1 to M45. The total list consists of 110 objects, ranging from M1 to M110. The final catalogue was published in 1781 and printed in the Connaissance des Temps in 1784. Many of these objects are still known by their Messier number. Because Messier lived and did his astronomical work in France in the Northern Hemisphere, the list he compiled contains only objects from the north celestial pole to a celestial latitude of about –35°. Many impressive Southern objects, such as the Large and Small Magellanic Clouds are excluded from the list. 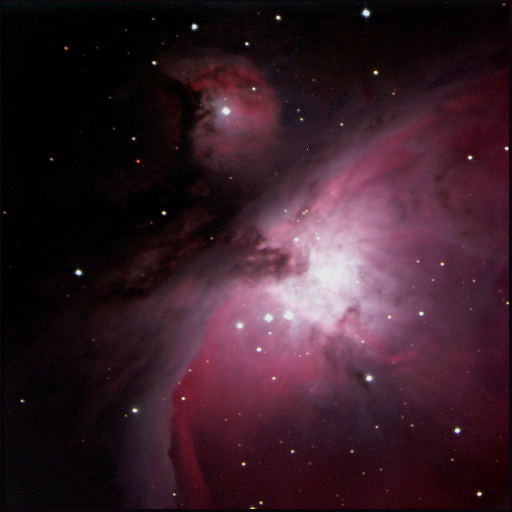 Because all of the Messier objects are visible with binoculars or small telescopes (under favorable conditions), they are popular viewing objects for backyard astronomers. Arab and Chinese astronomers noted a supernova in the constellation Taurus in the year 1054 AD. Technically classified as a 'Supernova Remnant', this is what happens to a star when it suffers a gigantic explosion. It's about 6,500 light years away, and is roughly 11 light years in diameter. Technical details about the image: it's a combination of 45 images, 15 with a red filter, 15 with a green, and 15 with a blue. Each exposure was 120 seconds long. Originally discovered by French Astronomer Jean-Dominique Maraldi in 1746, Charles Messier 'rediscovered' it 14 years later. 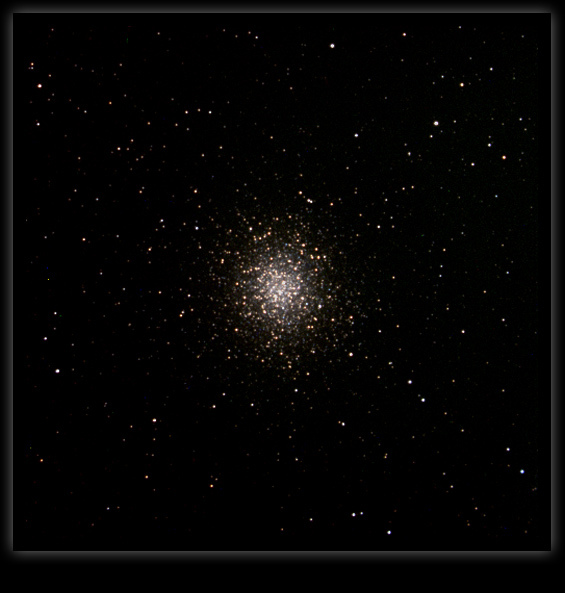 Many of those items in Messier's catalog were originally discovered by others, Maraldi is credited with two contributions to Messier's catalog, M2 and another globular cluster M15. M 2 is roughly 13 billion years old, one of the oldest globulars associated with our (the Milky Way) galaxy. It's diameter is about 175 light-years, and it's about 37,000 light years away. Containing about a half million stars, M3 is on the 'other' side of our galaxy, i.e. it's on the other side of 'downtown'. The latest distance estimate for M3 is 33,900 light years, and it's considered to be about 200 light years in diameter. It is in orbit around the center of our Milky Way galaxy, with its "apogalactic distance" (furthest point from the center of the Milky Way) about 66,000 light-years, and it's closest approach, "perigalactic distance" about 22,000 light-years. Technical details about the image: This image is a combination of one each red, green and blue filtered 300 second images. Each color frame was flat fielded with a flat field frame shot with the red filter, which seems to have worked pretty well. Initial processing was done in CCDSoft, as well as one pass through a Richardson-Lucy filter (Sigma 0.7, Number of iterations 5, Kernel size 15). The images were then imported into Photoshop for alignment, color combination and cosmetic cleanup. In short, this is the same method used on the M4 photo immediately below, and the results are much better than my old work flow (see the M2 photo immediately above). 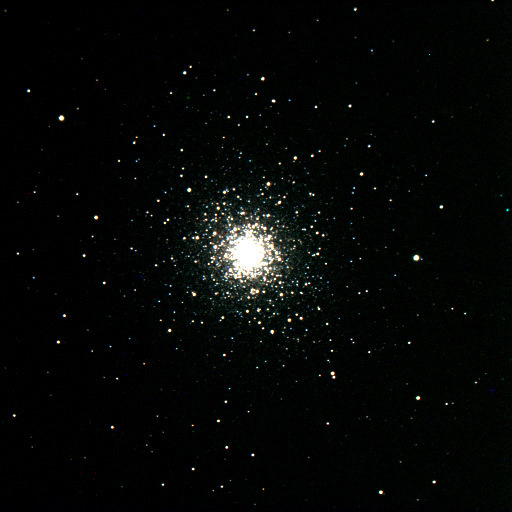 M 5 (NGC 5904) - globular cluster in Serpens Caput. Roughly 160 light years in diameter and 25,000 light years from us, Messier 5 is the only Messier object in the constellation Serpens Caput (Latin for 'head of the snake'). It is one of the largest globular clusters in our galaxy. It's always difficult to count the number of stars in a globluar cluster, but at a minimum it's thought that M5 has a stellar population of several hundred thousand. Technical details about the image: This image is a combination of one each red, green and blue filtered 240 second images. Each color frame was flat fielded with a flat field frame shot with the red filter, which seems to have worked pretty well. Initial processing was done in CCDSoft, as well as one pass through a Richardson-Lucy filter (Sigma 0.7, Number of iterations 5, Kernel size 15). The images were then imported into Photoshop for alignment, color combination and cosmetic cleanup. 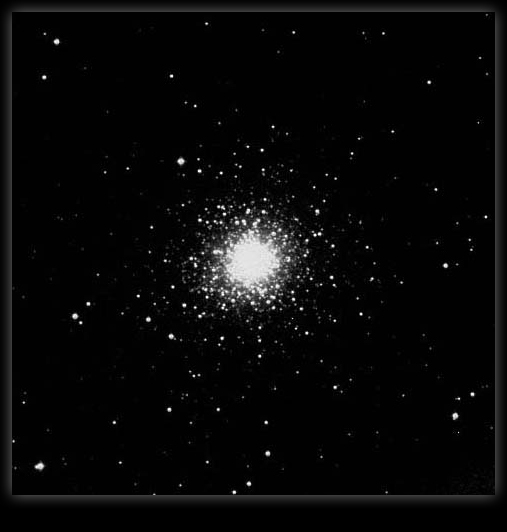 M 10 (NGC 6254) - globular cluster in Ophiuchus. This image needs more work to get the color balance correct. 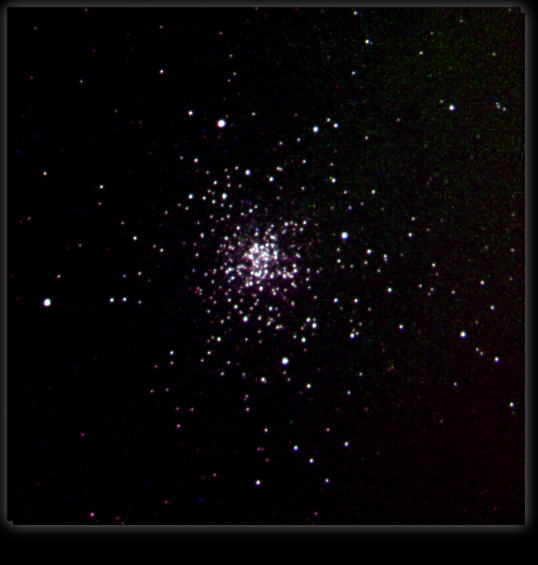 Technical details about the image: Same as Messier 5. 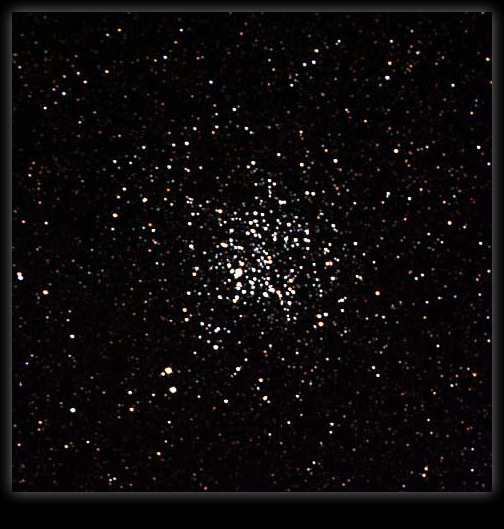 M 11 (NGC 6705) - open star cluster in Scutum. You can glimpse it with the naked eye under a clear dark sky and it's worth a look in even the smallest of telescopes or decent binoculars. M 13 is one of the nicest examples of these strange objects. In 1974, a radio message was transmitted toward M 13 from earth. M 13 was the chosen target because of its high star density (several hundred thousand is one estimate), and thus the higher probability that there would be a planet orbiting one of it's member stars with intelligent life. 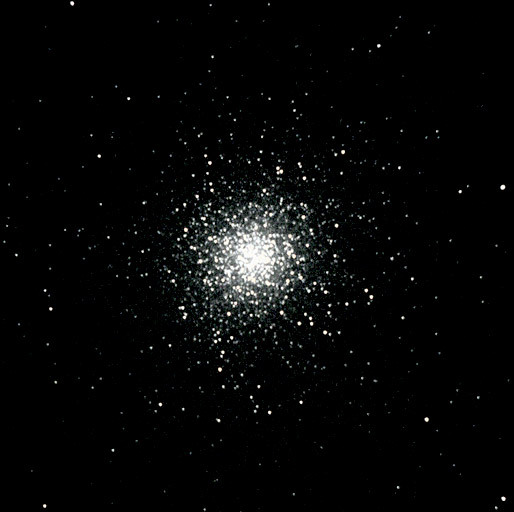 If we get a reply, it won't be until at least the year 52174 (two times the distance between us and M 13...25,100 light years). M 14 contains several hundred thousand stars. It has a slight ellipitical shape (it's a bit taller than wide), is about 100 light years across, and 30,000 light years distant. 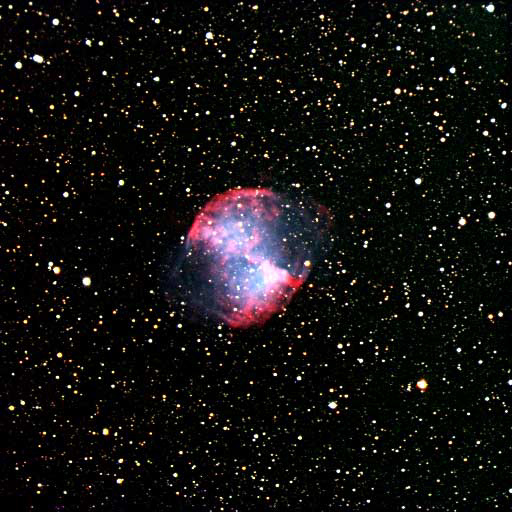 M 27 (NGC 6853)- the 'Dumbbell' nebula in the constellation Vulpecula. Discovered by Charles Messier in 1764, it's the most impressive 'planetary nebula' in the sky, and is easy with binoculars under a dark sky. Technical details about the image: it's a combination of 3 images, 1 each with a red, green and blue filter, each image was exposed for 10 minutes. M 29 (NGC 6913) - open star cluster in Cygnus. Although photographed on a fairly poor night (a typical late August evening in the Midwest, sky was quite hazy), the atmosphere can't be blames for what at first appears to be an unimpressive random grouping of stars. 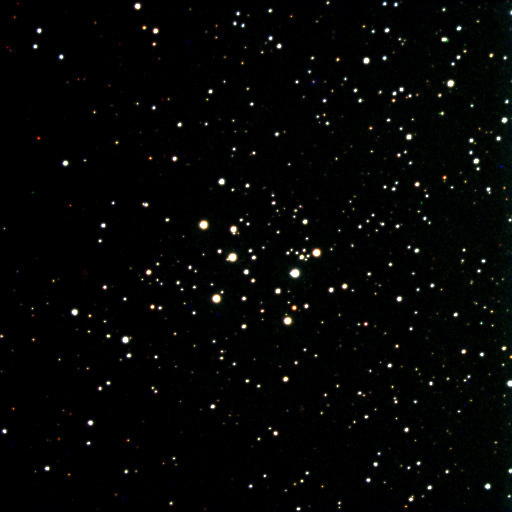 M 29 just doesn't have many stars to it, estimates range from about 20 to about 60. Still, it's a pretty sight. Probably the most photographed object in the night sky, the Great Orion Nebula is a wonder to behold even in a small telescope or binoculars. It can be seen with the naked eye under a reasonably clear sky. This image only shows the central part of the nebula, and shows only its brightest portions. Known technically as a 'diffuse nebula', it's about 1200 light years away (which is about 7,049,506,980,000,000 miles if I did that right). 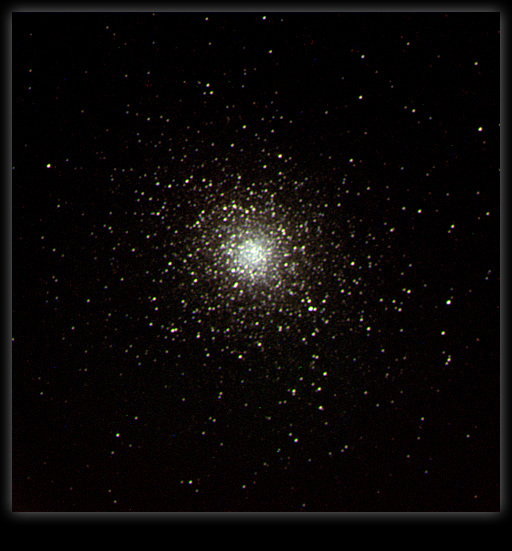 M 56 (NGC 6779) - globular cluster in Lyra. About 33,000 light years away and 85 light years in diameter, M 56 was discovered by Charles Messier in 1779 on the same day that he discovered one of his 44 comets. 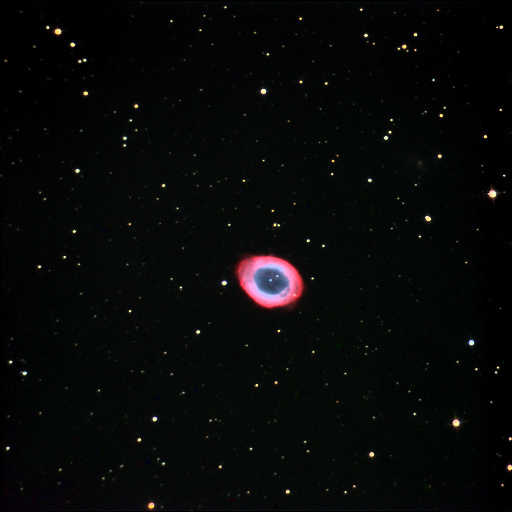 Roughly 2000 light years away, M57 is the gas expelled from the central star (visible right in the center of the nebula) as it switches from hydrogen to helium 'burning'. It's one of the best examples of a planetary nebula. M57 is nearly overhead near midnight in July at mid-northern latitudes. Under a clear, dark sky it can be seen in a small telescope or binoculars as a greenish oval. M 63 (NGC 5055) - Spiral galaxy in the constellation Canes Venatici. 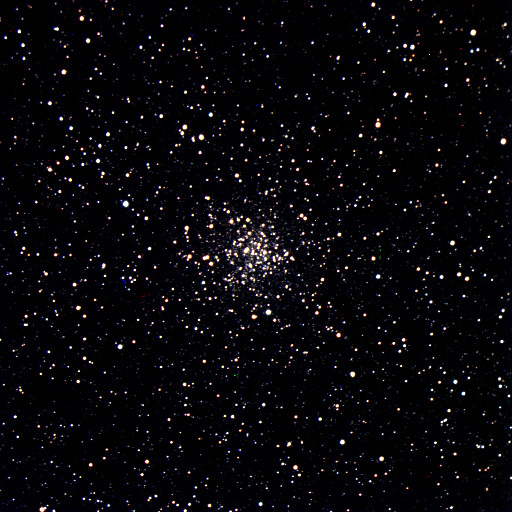 M 71 (NGC 6883) - globular cluster in Sagitta. 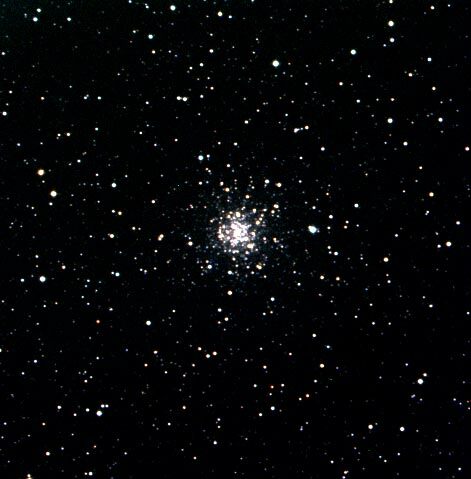 M 71 was, up until the 1970's, classified as an 'open cluster'. Looking at a photo of M 71 next to a classic globular and a classic open cluster, one can understand why...it looks like a loose globular or a tightly packed open cluster. Due to a variety of reasons that you are free to research if interested, the tilt went towards globular. M 73 (NGC 6994) - open star cluster in Aquarius. 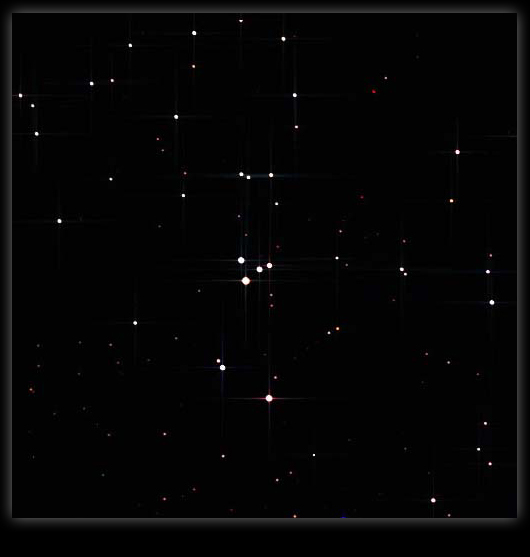 This open 'cluster' consists of the four bright stars in the center of the image. There is a lot of doubt about if these four stars are physically related. Current speculation seems to be that they just happen to share the same line of sight and thus appear as a cluster, but the stars may be at vastly different distances. Messier wrote that the cluster 'contained very little nebulosity'. There is no hint of nebulosity in this image, and I've examined other images taken with much larger telescopes that also fail to show any. Could be that M 73 is just as it appears and nothing more, a visually pleasing grouping of four stars? 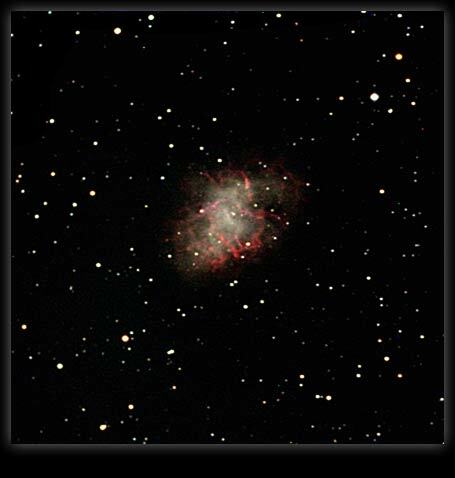 M 73 is at the southern declination limit of what I can image. At about -13 degrees declination (about 35 degrees about the southern horizon), I'm getting well into the heavy light pollution of Indianapolis. M 92 (NGC 6341) - globular cluster in Hercules. 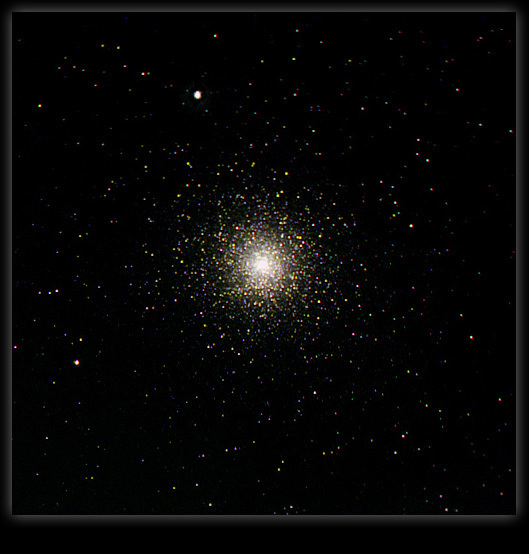 For the most part, globular clusters look the same, and indeed M 92 looks like a smaller version of M13 (which is considered the finest visible from the northern hemisphere). Technical details about the image: This image is one frame each of red, green, and blue, dark-subtracted and flat-fielded, each exposure was 5 minutes. 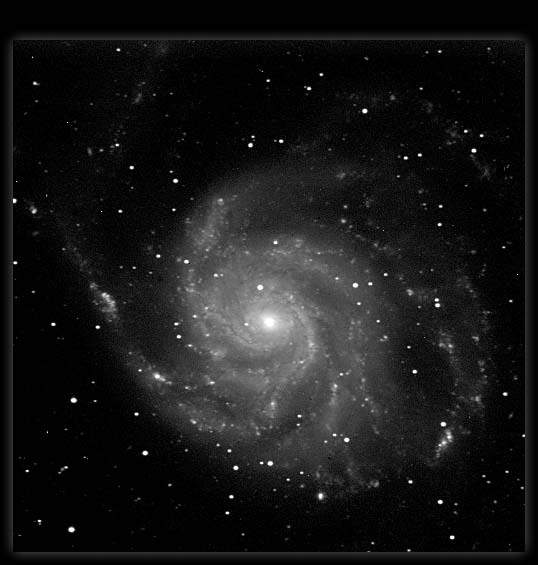 M 101 (NGC 5457) - face-on spiral galaxy in Ursa Major. About 27 million light years distant, M 101 is about twice the size of our Milky Way galaxy. Technical details about the image: This image is the 'luminance only' portion; I still need to shoot the red, green, and blue components. To date, this is the longest single integration I've been able to make. It's 900 seconds (15 minutes). At home this would be impossible, as the camera would have saturated somewhere between five and ten minutes into the exposure. In this image, the background count is around 5,000 ADU's. I took this image while on vacation in Twin Lakes, Michigan in June of 2009. Twin Lakes has about the same level of light pollution one would see anywhere outside a 30 mile radius of Indianapolis. Kinematical distance modulus (to M 101)= 29.28. The distance modulus information is from the HyperLeda web site. This image is an enlarged portion of the upper left corner of the M101 image above. 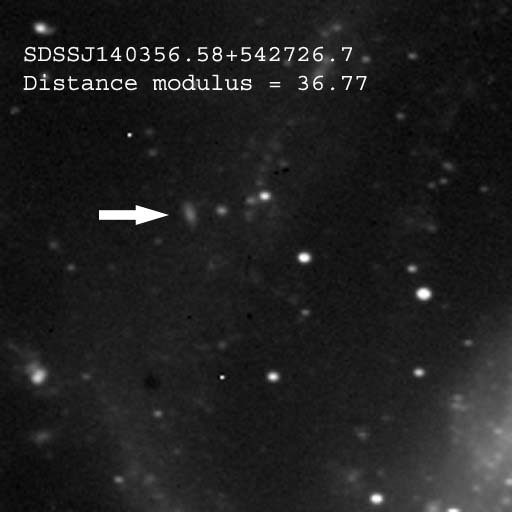 The arrow points to galaxy SDSSJ140356.58+542726.7 which is the most distant object I have (so far) taken an image of. Its kinematical distance modulus is 36.77. The other 'fuzzy things' in the image are most likely clumps of hydrogen associated with M101. M 107 (NGC 6171) - globular cluster in Ophiuchus. M 107 didn't get added to Messier's list until Helen Sawyer Hogg put it there in 1947. It's about 80 light years in diameter and 21,000 light years distant. As globulars go, it's fairly 'open', i.e. not crowded. Technical details about the image: Three 300 second integrations, one each with a red, green, and blue filter, dark subtracted and flat fielded. M107 is about the southern limit of what I can image. At maximum elevation (when this image was taken) it only gets to 36 degrees about the southern horizon. This means not only looking through the light of Indianapolis, but also shooting over the roof of a house that's about 50 feet away. M 107 isn't the most spectacular of globular clusters, but this image does not do it justice. 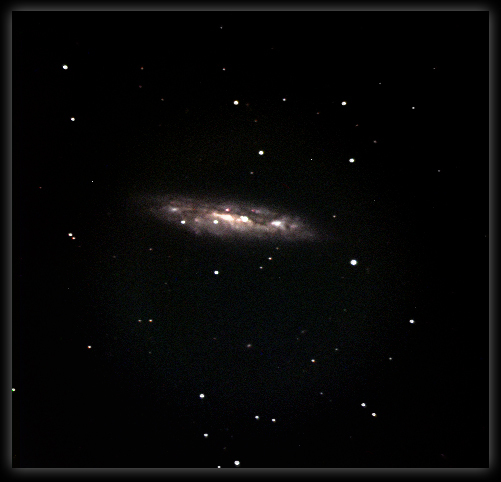 M 108 (NGC 3556) - spiral galaxy in Ursa Major. 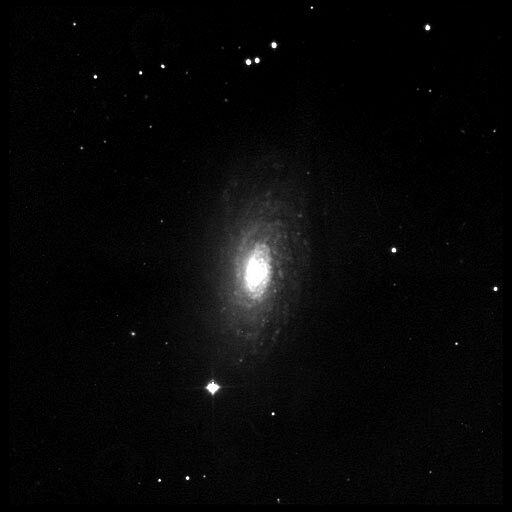 Viewed nearly edge-on, M108 lacks the well-defined spiral pattern common in an 'Sc' type galaxy. Technical details about the image: It's a combination of 10 separate images (four unfiltered, and two each with a red, green, and blue fiters). Each exposure was for 5 minutes. I used a generic 'clear' flat field to process all the images, which explains the unevenness in the background. I need to image this one again and strive to even out the background.